I'm incredibly honored (and surprised!) 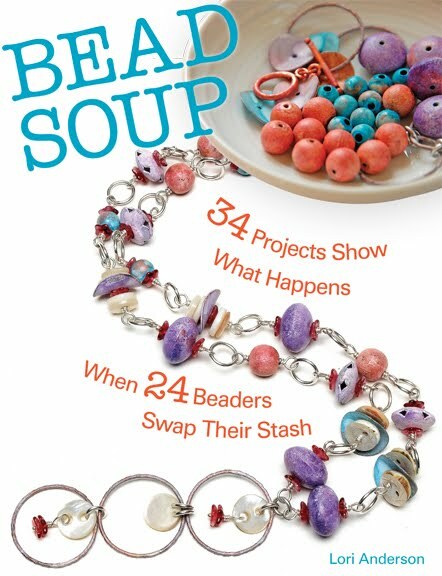 that I have two pieces in the spring 2016 issue of Belle Armoire Jewelry. I've always looked at Stampington magazines as the pinnacle of "it" and for years and years had hoped to one day be good enough to be in one of their publications. 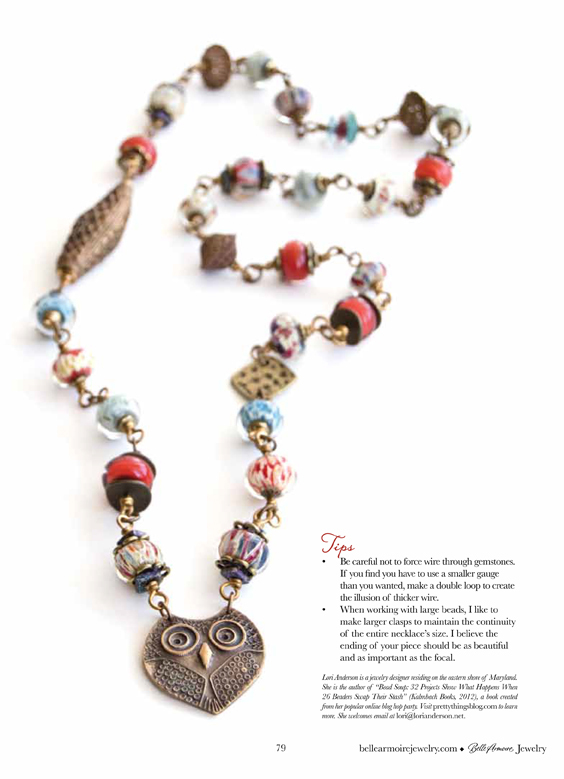 I've been in both a Belle Armoire Jewelry and a Jewelry Affaire magazine, but I have to tell you, the thrill never goes away. These are not new pieces. They're new to any magazine, but not new to me. I haven't made anything in over a year. The owl necklace is in my personal jewelry box, and the nautilus shell and turquoise necklace, well, I haven't decided what to do with that one yet. 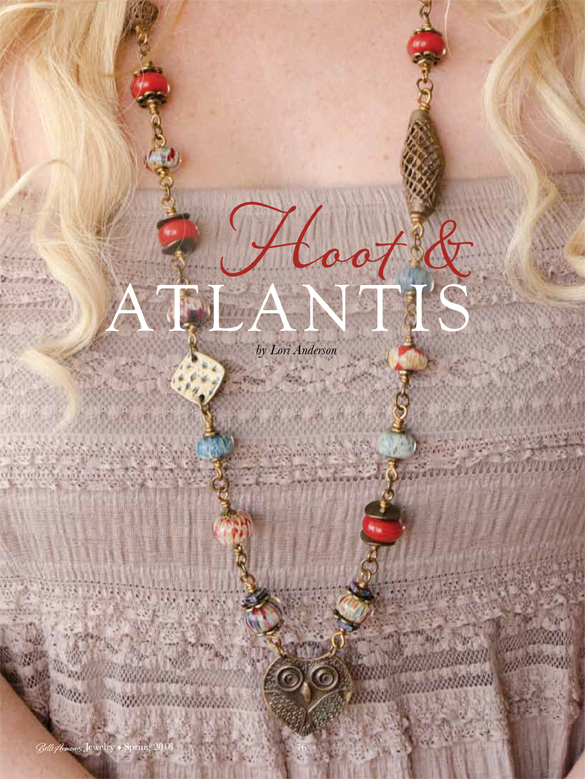 First, the Hearts of Atlantis necklace. I remember when I bought that ammonite. I was at a bead show with a friend and wandered into a booth full of odd things -- coins, shells, Tibetan bells -- you get the idea. In a tray were these lovely nautilus-like fossils. There were about fifteen, some with a turquoise inlay and some with a pearl inlay. Zack loves fossils and I wanted to buy one for him and one for me, so I snapped a picture and texted it to my husband. In no time I got a "BING" and learned Zack wanted the pearl. I had looked through the entire tray for one of each with just the right coloring on the fossil, so happily took them home. 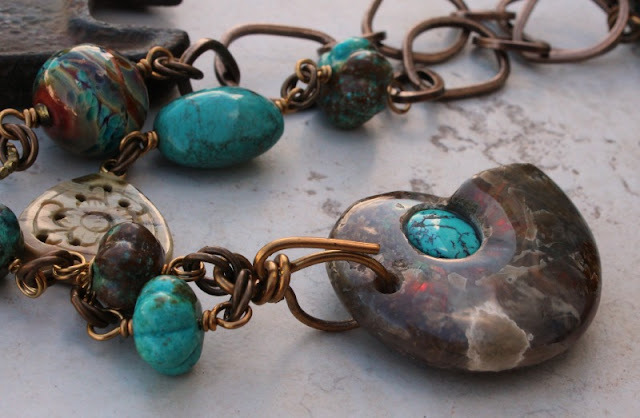 The necklace includes amazing pumpkin-carved turquoise beads gifted to me from a friend, a Lori Lochner lampwork bead, and wire circle of the tiniest metal beads I've ever seen that I made myself, and a sturdy but pretty bronze clasp I made myself. I also created the bail so from the side it had a little architecture. If anyone is interested in this one, it's $152 due to the cost of materials and the time it took to make. Email me if you would like it. 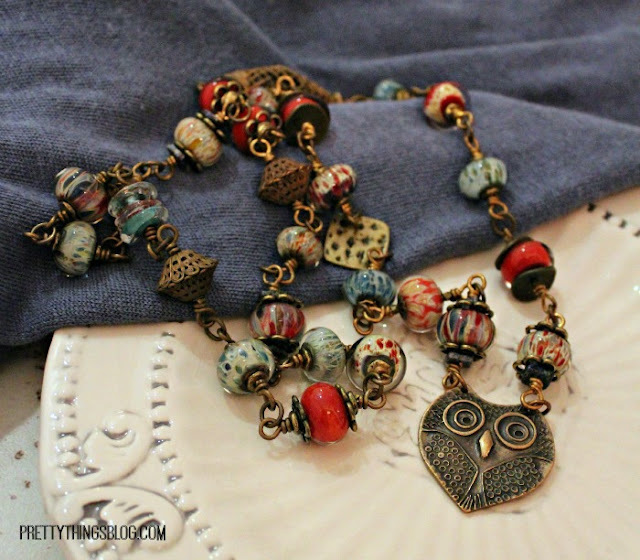 The second necklace is from my jewelry box and I made it to go with a heather blue tunic. I never thought the red would work with it, but it really looks amazing (if I do say so myself, which I guess I just did!). This is a long necklace with a seemingly random placement of beads, but it took me forever to really get the balance correct. 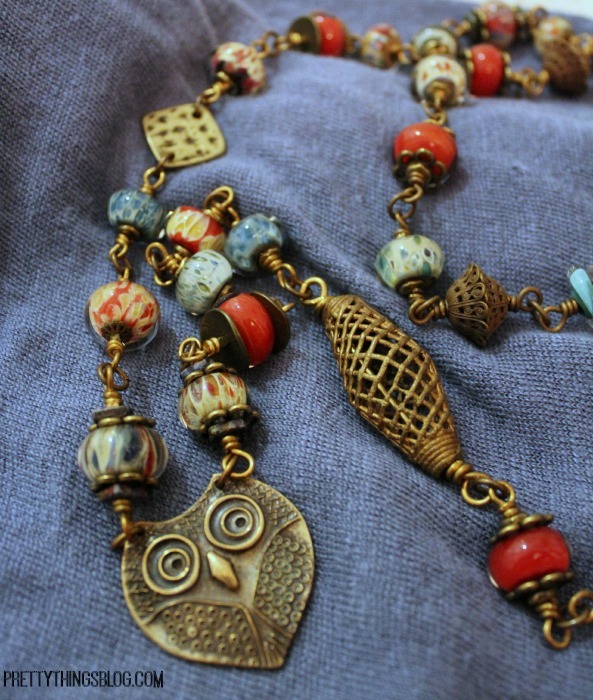 I made the first beads above the bronze owl by Lesley Watt match. After that, it was a free-for-all. I used square Greek ceramic spacers, bronze flower spacers, and large wavy spacers. 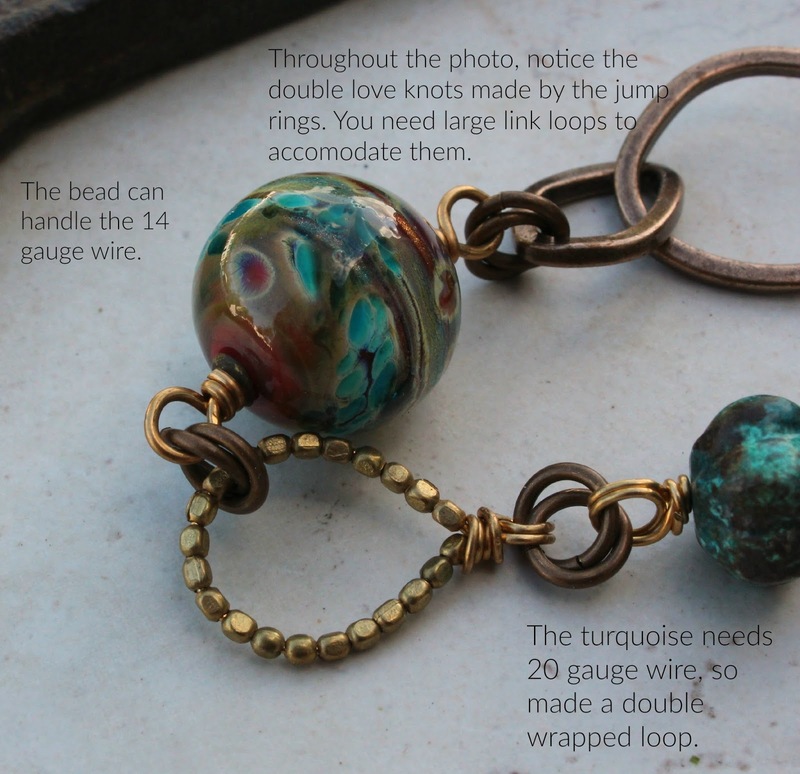 I kept the spacer selection small since I had an abundance of patterns and colors in the lampwork beads. 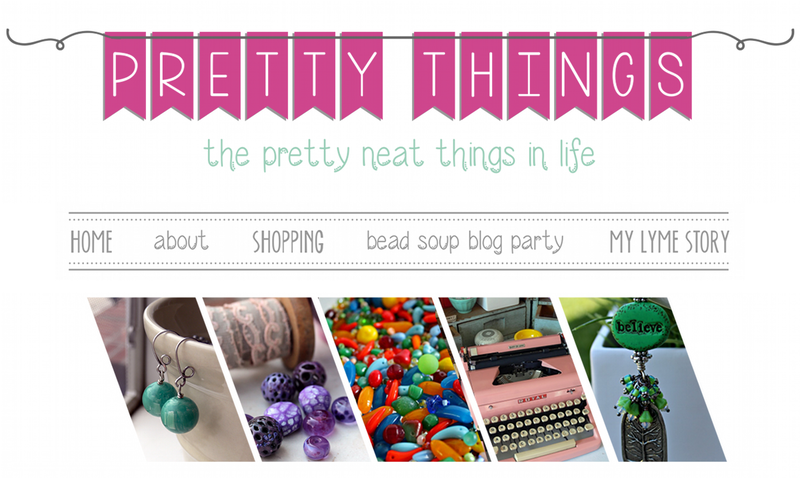 I had an old Tibetan bead I'd bought ages ago at the Bead and Button show and I constantly was fiddling with its placement -- I didn't want it to be stuck behind my neck or hidden in my hair. I broke up the lampwork with three antiqued bronze beads I'd been hoarding and a diamond-shaped hammered piece I took off an old belt. 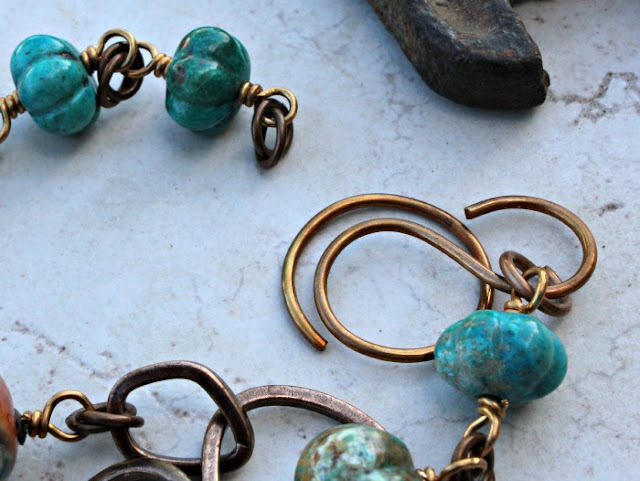 I made this necklace specifically for this tunic. The magazine goes on sale March 1st at most large bookstores, or you can order it here or never miss an issue (four a year) and subscribe here. It's nice to have a reminder that this is what I used to do almost every single day. 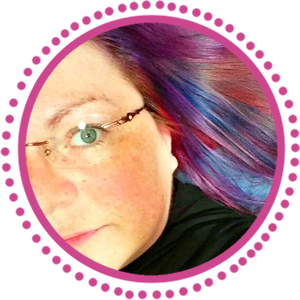 After a huge destash in the near-ish future, I hope to get back to it, and (crossing my fingers), have my sights set on a show in October. This post is truly random. It is. Starting with this. Pink. Love me some pink. My childhood bedroom was painted pink and the bed had a pink coverlet. 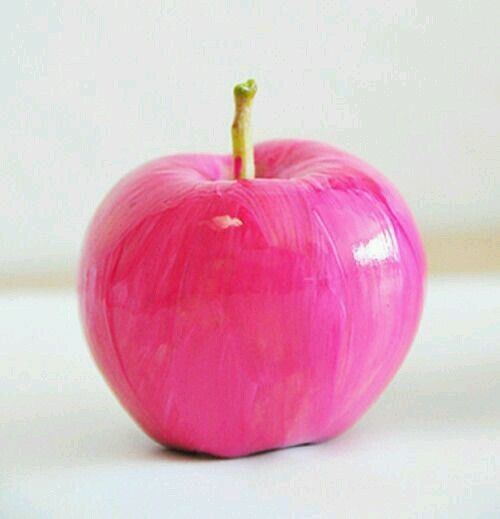 And while this pink apple from The Glitter Guide is beautiful, don't eat paint. I hope they repainted a fake apple because a rotting pink apple is just...well, wrong. Wrong, sad, and yuck in so many ways. 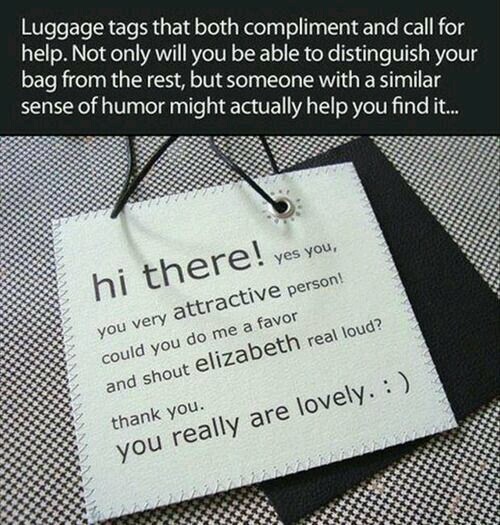 This luggage tag via HumorTrain is really clever. But I see several problems. a) Everyone is going to grab your bag off the rotating belt to read all those words, then pass it around to the gathering crowd so they can enjoy the humor, too (and probably snap a selfie with it). Yet not one of them will yell, "ELIZABETH!!!". I bet they won't even put it back on the conveyer belt. b) A pleasant enough guy will call your name and hand you your bag. Then he'll ask if you'd like to share a taxi to your destination since of course, it's on his way. SURPRISE, his destination comes after yours, so he now knows where you live. That gives him enough info to call you for a date. And before you know it, you have a real life John Cusack holding a boom box over his head while standing under your window blasting Phil Collins. c) Some poor soul in Wyoming is going hoarse yelling, "ELIZABETH!" while you're at Luggage Claim in Georgia. 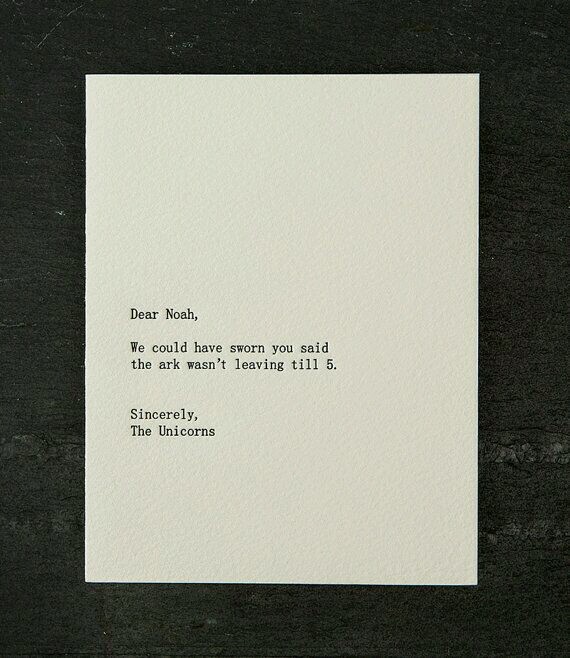 Hope these made you laugh a little! 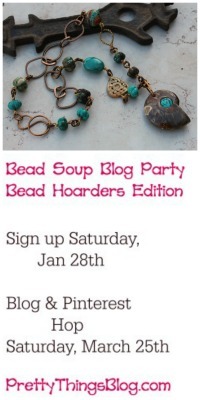 New post at LemonSugarLyme for those interested. Rain coming. That nearly always means migraine. 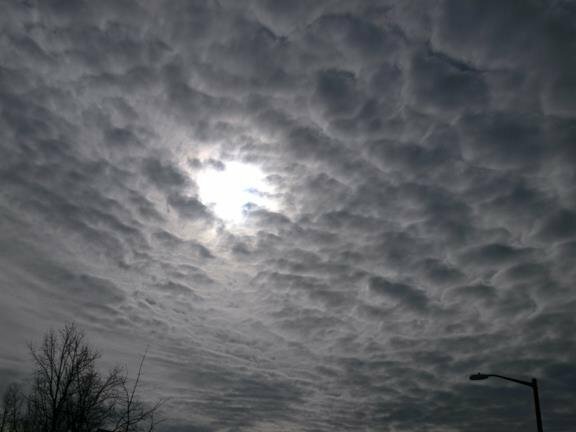 But the hole in the clouds...I get to choose if it closes in with darkness or expands into light.